On Thursday, April 28th, Community Energy Development Co-operative is celebrating the official opening of our solar system at Salus Marine Wear. 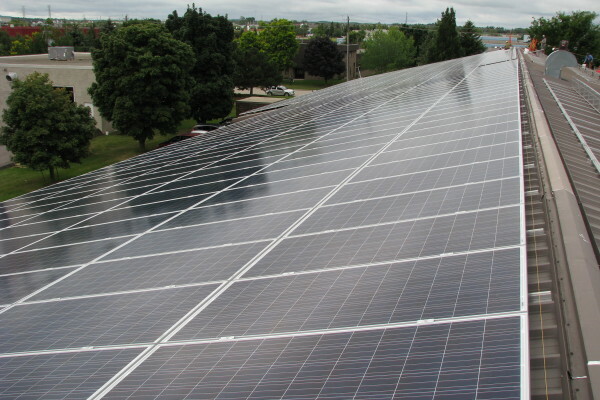 Salus Marine Wear, a local lifejacket and PFD (Personal Flotation Device) manufacturer, has installed a 160 kW solar system at their headquarters and production plant in Waterloo. Jointly owned between Salus Marine Wear and Community Energy Development Co-operative, this solar system generates electricity which is then sold into the grid through a contract with the Independent Electricity System Operator. Jointly owned by Salus Marine Wear and CED Co-op, this project will provide profits for both their business and our investors. To date we have generated 53 Megawatt-hours of power – equivalent to powering 162,000 lightbulbs for a day, or taking 21,000kg of CO2 out of the atmosphere. The local economy is also important to Steve, who started Salus Marine Wear here, and has maintained production facilities in the Region of Waterloo as the business grew. Manufacturing in Waterloo means PFDs are assembled and sewn by Canadians who take exceptional pride in their work and quality, addressing potential problems in minutes, not days. Equally important is the unique place Salus holds in the Personal Flotation Device (PFD) market as the only naturally buoyant flotation device manufactured in Canada. The solar system at Salus Marine Wear is jointly owned by Community Energy Development Co-operative (CED Co-op). As a for-profit co-operative focused on investment in renewable energy, CED Co-op purchases renewable energy projects and uses the revenue from power generation to pay dividends to its members and a return on investment for their bond holders. Their last offering statement raised $9.6 million for investment in renewable energy projects such as the solar system at Salus Marine Wear, and they anticipate raising more funds to continue to further adoption of renewable energy in Ontario. Please join us for this exciting event. There will be brief speeches from Brian Unrau, President of Community Energy Development Co-operative, and Steve Wagner, owner of Salus Marine Wear, followed by a ribbon cutting. Tours of the Salus facility will be available.